After we watched Stony Brook win the America East Regular Season Championship, my older son Matthew and I exited Pritchard Gym while the players were still hoisting the America East Regular Season Championship trophy. We made our way to the car and headed out for the long trip to New Rochelle for the last regular season games for the women's and men's teams. The trip took a little more than a hour, thanks to lighter than usual Sunday traffic and a little bit of a lead foot by yours truly. Matthew was wise enough to have slept the entire trip. I had to wake him as I parked our car in the Iona garage. After Matthew stretched, we walked to the Hynes Center. Iona was hosting St Peter's in a Senior Day doubleheader. The women's game was first and the men's game would follow a hour later. When we walked into the gym, the women's game was already in the second half with the Gaels up eight, 39-31 with about sixteen minutes left. But as basketball is a game of runs, the Peahens went on a 11-4 spurt in the next four minutes. Iona was only up one, 43-42 with about twelve minutes left and Iona Women's Head Coach Tony Bozzella was not too pleased. But what was going to be a microcosm of the men's game, the Gaels outscored the Peahens 31-7 the rest of the way, which included a game ending 16-0 run. St Peter's missed their last eight shots and committed two turnovers in that span. Meanwhile, Iona hit eighteen of their twenty free throw attempts in the second half. The Gaels' Women's team won the first half of the doubleheader 74-49. Matthew and I joined Coach Bozzella, his family, my friend Mal and his friend Emilie for the Senior Day Dinner at a reception room in the Hynes Center. It was a nice event where Coach Bozzella briefly spoke about how his group of seniors were such helpful mentors to the freshmen and sophomores on the team, He spoke how this team was a family and he thanked all the parents and people who have supported the team during the season. It was a nice reception. We left the reception and headed back into the Hynes Center Gym several minutes after what was supposed to be the start of the game. Much to my surprise, the Senior Day awards ceremony for the six seniors on the Iona Men's Basketball Team was still taking place. When we got to our seats, all the way up in the top rows of the general admission side of the gym, Scott Machado was being introduced last to the packed crowd. After Machado was given a standing ovation by nearly the entire crowd, the six Iona players; Machado, Michael Glover, Randy Dezouvre, Kyle Smyth, Jermel Jenkins and Trinity Fields all raised their framed jerseys while photographers snapped picture after picture. Then the Iona Bagpipe Band came out, which was a nice treat for this Irishman. Finally, to top it off, Scott Machado's brother sang a wonderful rendition of the national anthem. The Gaels spotted the Peahens a 4-0 lead. A Glover dunk and a Momo Jones three put Iona up to stay 5-4. But St Peter's kept it close throughout the first half. The score was only 17-14 when Jenkins hit three consecutive three pointers in a row to give the Gaels a 26-17 lead. But the Peahens refused to go away in the first half and actually cut the deficit to five, 40-35 at halftime. As I noted earlier, Matthew and I were in the upper rows of the general admission seating opposite the Iona bench. One of the perks though of sitting in that section was being directly behind my favorite pep band in New York college hoops, the Iona Pep Band. The pep band was killing it at halftime playing "Sussudio", "Brickhouse", some Led Zeppelin, then "Frankenstein" and more Led Zeppelin. Later on, they made my day by playing the theme song to the old TV show "The Wild, Wild West". The first four plus minutes of the second half saw very little change. Iona had pulled out to an eleven point lead. But St Peter's was able to cut the lead back to seven, 50-43 with a little less than sixteen minutes left. At the under sixteen media timeout, the pep band played the James Bond theme song. Perhaps the pep band knew that the Gaels were about to use their "License to Kill" on the Peahens. It started innocently enough with two Sean Armand free throws. Then it was a three point play by Machado, followed by layups by Dezouvre and Glover. Jones followed up with a three point play, then an Armand went back to back with a three pointer followed by an old fashioned three point play. Before you knew it, Iona was up 68-43. But the Gaels weren't done yet. Another three point play by Jones was sandwiched between two Glover layups. Jenkins once again found his three point shooting touch and buried another two shots from beyond the arc. It was a 31-0 run before Lamin Fulton ended it with a three pointer. The Gaels were up 81-46 with still eight and a half minutes to go in the game. It turns out that many fans, knowing that the game was over, actually left at this time. Matthew and I were able to move down several rows and get a better view of the last few minutes of the game. All that was left was for Iona Coach Tim Cluess to take his seniors out one by one. Then I just needed the pep band to play "Peg" to make my night complete. Sure enough, late in the second half, the band cued up my favorite Steely Dan song. Iona took its foot off the throttle down the stretch, despite pleas from Matthew for the Gaels to score one hundred points. Iona just missed, winning handily 98-61. In a rarely seen nice touch, Cluess let Smyth, a key player and a starter for most of the season, stay on the court and dribble out the last few seconds of the game. The beat down of St Peter's was perhaps a little payback for the Peahens knocking the Gaels off in the MAAC Championship game last season. But that was a much better St Peter's team than the 5-25 team I saw Sunday evening. In the college basketball world, things can turn around quickly in a year. Jenkins, in his last regular season home game scored a career high twenty one points on seven three pointers. Jones led Iona with twenty four points, while Glover and Armand each had fourteen. Machado nearly had another double double with nine points and twelve assists. Darius Conley led three St Peter's players in double figures with twelve points. As Matthew and I made our way out of the Hynes Center for perhaps the last time this season, I wondered two things. One, I thought about whether Iona could not only win the MAAC Championship but also make a run to the Sweet Sixteen this season. Second, I wondered if the Iona Pep Band hires themselves out to play at parties. Correction to Previous Post on Hofstra Senior Day. I want to correct a mistake I made on my Hofstra Senior Day post. As an anonymous viewer pointed out to me, it was Athletic Director Jack Hayes that presented the ball to Charles Jenkins not Coach Mo Cassara. As my way of saying "I'm sorry", here's also his video of the Jenkins presentation. Enjoy. See you in Richmond, Hofstra. As Day Three of our Four Day Weekend of Hoops started, my older son Matthew and I took the familiar trip over the Whitestone Bridge to the Hutch to Pelham Parkway to head to the campus of Fordham. Unlike the night before, there were no crazy drivers on the Whitestone looking to start a NASCAR wreck. So, it was a much calmer ride this time. As I have written before on this site, going to the Rose Hill Gym is like Saturday Mass to me. Though I am Protestant and not Catholic (I have my Irish grandfather on my mom's side to thank for that. Long story), basketball at Rose Hill on a Jesuit campus is a religious experience to me. As for my six year old son, it was a chance for another fun basketball game complete with another free T-shirt to add to his collection, since it was "Whiteout Day" at Fordham. Of course, he had his standard culinary fare of a soft pretzel and a water. Some things never change. The game against the Explorers was an important game for the home team Rams. They needed a win to keep their remote hopes of playing in the Atlantic 10 Tournament alive. Only the top twelve teams make it to the conference tournament. It wouldn't be easy for Fordham because LaSalle was entering the game with eighteen wins and was tied for sixth in the conference. This was the only game that Matthew and I saw this past weekend that was not a Senior Day game. That's because the A-10 regular season doesn't end until next weekend. I have always thought that does the A-10 a disservice, because then its tournament is up against all the Power Six conference tournaments. If they would finish their season a week sooner, they might get more national exposure playing their conference tournament the week before all the Power Six conference tournaments. It was pretty evident from within the first eight and a half minutes of how the two teams would be on offense. LaSalle showed how balanced they were as five Explorers; Jerrell Wright, Ramon Galloway, Earl Pettis, Sam Mills and Tyreek Duren each scored at least one basket. Each of those five players averages between 9.5 and 15.2 points on the season. Meanwhile, Fordham's Chris Gaston, their leading scorer and only one of three Rams' players who averages 9.9 points or more per game, was a one man wrecking crew. He scored fifteen of Fordham's first twenty points as he literally willed his way to the basket, often going over several LaSalle players. With eleven and a half minutes to go in the first half it was LaSalle 21 Gaston 15 Rest of Fordham 5. The Rams actually took the lead 25-23 on a Bryan Smith three pointer. But the Explorers responded with a 12-0 run, as again five different LaSalle players scored over the nearly four minute span. The Explorers were up 35-25 with 6:45 left. The Explorers could have been up a lot more, but both teams went scoreless for the next several minutes. Once Gaston cooled off, Fordham struggled to score. But LaSalle had four turnovers the last few minutes of the half. The Rams were fortunate to be down only eleven, 42-31 at halftime. Gaston had nineteen of their thirty one first half points. During a first half timeout, a member of the New York Giants brought out the Lombardi Trophy onto center court. Apparently fans could go out into the lobby to pose for photos with the Super Bowl Trophy. My son was not impressed. He was there to see basketball and he wanted to see Gaston keep scoring points. The Explorers maintained their eleven point lead over the first five minutes of the second half. Pettis and Galloway combined to score LaSalle's first ten points. Fordham was hanging in there as other players such as Kerwin Bristol and Smith finally scored besides Gaston. The Explorers led the Rams 52-41 with about fifteen minutes left in the game. Then came the turning point of the game. LaSalle got careless with the ball and turned it over four times in the span of about three minutes. This resulted in Fordham going on a 12-0 run. Branden Frazier came alive with two three pointers and no surprise, Gaston had two layups as well. Frazier's second three pointer put Fordham up 53-52. LaSalle would actually regain the lead, 58-57 on a three pointer by Mills. The teams would trade the lead a couple of times. The Explorers would take a 62-61 lead on a layup by Galloway with five plus minutes left. But it would be the last points LaSalle would score the rest of the way. Once again, the Explorers got careless with the ball and committed four turnovers over the last three and a half minutes of the game. Meanwhile, Gaston would score four of the last six points his team would score. And sure enough, after Pettis missed a three pointer at the end of the game, it was Gaston who rebounded the ball, his sixteenth in the game. Fordham had a 67-62 win. As much as the Explorers gave them the game, a lot of the credit for the Rams' win belongs to Gaston. He was a man among boys with thirty five points to go along with his sixteen rebounds. How dominant was Gaston? Fifteen of his sixteen rebounds came on the offensive glass, a truly sick statistic. He was downright relentless in the paint. Frazier was the only other Fordham player in double figures scoring with eleven. The stat sheet again showed LaSalle's showed their balance as all five starters scored in double figures. But what killed the Explorers was the seventeen turnovers, many of which came in bunches in the first and second half. You could also say Gaston equally killed them as well, as Fordham outscored LaSalle in the paint 42-26. As Matthew and I made our way out of a back exit of Rose Hill Gym, where the video cable feed for the Yes Network was setup, Chris Gaston made a new fan. My six year old son pointed out "Daddy, Number thirty three had a real good game." "Yes, Matthew. Yes he did." Day Four of our four day weekend of hoops concluded today with a tripleheader. First, it was Maine vs. Stony Brook, then a St. Peter's - Iona double feature; the women's game followed by the men's game. And it was Senior Day for all three home teams. I picked up my older son Matthew from baseball camp, then dropped off my younger son Jonathan with my in-laws. Then it was off to Stony Brook for our first game. We got there about a half hour before game time. In the confusion of putting my tickets away, I left my wallet on the counter top of the concessions area. Thankfully, the person running the concessions gave it to a security guard. When I realized I had forgot my wallet, the concessions person pointed me to the security guard who gave me my wallet. Can't thank both of them enough. Crisis averted. As we walked into a sold out Pritchard Gym, they were finishing the Senior Day ceremonies. Dallas Joyner, Bryan Dougher, Al Rapier and Danny Carter were honored on their last regular season home game. The game was being televised on CBS Sports Network. Don Criqui, who I grew up watching on Saturday afternoon NBC college basketball games, was doing the play by play while Wally Szczerbiak was doing the color. Feeding off the emotion of Senior Day and the energy of the crowd, the Seawolves came out strong from the start. After Maine's Gerald McLemore's three pointer cut Stony Brook's lead to 5-4, the Seawolves scored the next ten points. Dougher scored eight of those points, including two three pointers. Stony Brook was up 15-4 with not even four and a half minutes gone by in the game. After a classic hustle play by Tommy Brenton resulted in him scoring on a left handed driving layup, the Seawolves' lead had swelled to 26-11. It looked like Wolfie, the Seawolves Mascot, could put away the foul shot distracting Shake Weight away for the day. Meanwhile, the Stony Brook Pep Band was playing some good tunes, including a good rendition of Santana's "Oye Como Va". But Stony Brook then suddenly went cold from the field, going two of eleven the rest of half. The Seawolves also committed six turnovers over the last seven minutes of the half. This allowed Maine to go on a 13-4 run to end the half and cut the lead to six, 30-24. At halftime, Matthew was really hungry and wanted two soft pretzels. Thus we made our way to the concessions while a local CYO team played at halftime. We got back for the tale end of the CYO game and Matthew was as aggressive eating his first pretzel as Brenton drove the lane on that layup. The Black Bears picked up right where they left off at the end of the first half. After he was fouled shooting a three point play, Maine's McLemore hit all three of his foul shots to cut the lead to one, 36-35. The Black Bears had now outscored the Seawolves 24-10 over two halves. Maine was still within one 40-39 with a little over nine minutes remaining. Then Stony Brook finally started inching away. Dallas Joyner and Al Rapier combined on a 6-0 mini run and the Seawolves went back up by seven, 46-39 with eight and a half minutes left. When you watch a Stony Brook game live, you will be treated to the best mascot perhaps in the country, Wolfie Seawolf. Whether he is part of the dance team's "Greased Lightning" dance set, or when he is putting on the big hairdo and the chains and dancing to LMFAO's Party Rock anthem. And of course, Wolfie leads the kids in the "Cotton Eye Joe" dance at the under eight media timeout. The dance team brought cardboard cutouts of all the Stony Brook players and Coach Steve Pikiell onto the dance floor and danced with them. It was a very funny touch to the routine. Normally a seven point advantage with that much time remaining isn't that much of a cushion. But when you play defense like Stony Brook does, a seven point deficit seems like a fourteen point deficit. Thus, try as they did, Maine could not get any closer than three points the rest of the way. In fact, Maine only shot thirty percent in the second half. It didn't help the Black Bears any that the Seawolves were eleven of fifteen from the line in the second half. After Justin Edwards missed a three pointer with fourteen seconds left, it was only fitting that the heart and soul of the Seawolves, Tommy Brenton, would grab the rebound and dribble out the clock. Stony Brook had a hard earned 55-48 win to clinch their second America East Regular Season Championship in the past three seasons. This gives them the number one seed in the America East Tournament and if they win two games in Hartford, they will have home court advantage in the America East championship. As the team celebrated by their bench hoisting the America East Regular Season Championship trophy, Coach Pikiell.took a microphone and walked to center court. He first thanked the band, then the cheerleaders, then the Stony Brook community for all their support. Pikiell then talked about Stony Brook setting a team record with a 14-2 conference record. Finally, Pikiell spoke about how great and how classy his seniors were as a whole. I had never seen a coach do that after a game and it was truly a classy gesture by Pikiell. As Matthew and I left the Pritchard Gym to head to New Rochelle for our second and third games in our tripleheader of hoops, I talked to my older son about the possibility of being at Pritchard one more time. That would be for the America East championship on March 10. All the Seawolves have to do is win two games in Hartford next weekend. There's no place I'd rather be on March 10 at 11:00 AM than Stony Brook, New York. Make it happen, Seawolves. After watching Fordham rally to defeat LaSalle, my son Matthew and I were able to quickly make our way out of a back exit of Rose Hill gym. We made it to our car in the Fordham parking garage quite quickly before the rest of the Ram and Explorer fans. Our mission was to make it to Hempstead by 4:00 PM. We made it to Hofstra with time to spare for Senior Day at the Mack Center as Hofstra was hosting UNCW. Senior starters Mike Moore, Nathaniel Lester and Dwan McMillan were all given a special ceremony by Hofstra University before their last home game as members of the Pride. All three have been significant contributors this season. Moore, the leading scorer in the CAA, and Lester, the eighth leading scorer in the CAA, both scored their 1000th career points for the Pride this season. McMillan, the CAA leader in assists per game, became the starting point guard after Steve Mejia struggled with injuries. The three thousand plus fans in attendance gave all three a nice ovation, but nowhere near the ovation that last season's seniors Brad Kelleher, Greg Washington and Charles Jenkins received for Senior Day last season. Perhaps that might have been because a) the Pride had a sold out Mack Center on Senior Day last season and b) the Pride were 13-4 in conference on Senior Day last season as opposed to 2-15 this season. It just so happened that Washington and Jenkins were in attendance for the day's festivities. The Pride came out very quickly as they have done on several occasions this season. Lester scored five quick points and Hofstra went out to a 9-0 lead. UNCW Head Coach Buzz Peterson was so upset with his team's play, he benched all five starters two minutes into the game. As has occurred several times this season, the Pride would see their early lead evaporate. The Seahawks went on a 14-3 run over four minutes. Tanner Milson's second three pointer put the Seahawks up 14-11 with twelve and a half minutes left. The Hofstra fans had seen this act before and were afraid of the same result. However, the Pride responded with a huge run. It started with what must have been forward Moussa Kone's longest jumper of the season, which was a ten foot bank shot. Then a Moore three pointer and a Lester layup put Hofstra back up 18-14. Those three baskets were part of the Pride outscoring the Seahawks 34-11 the rest of the half. Hofstra hit on nine of their last thirteen shots from the field and only missed two of their thirteen free throw attempts for the entire half. The Pride led at halftime 45-25 in what was easily their best first half of the season. The team shot six of ten from beyond the arc, had thirteen assists and outrebounded the Seahawks 21-11 in the first twenty minutes. Moore and Lester had thirty two combined points. This didn't seem like the same Hofstra team that had lost to UNCW in Wilmington earlier in the season. During the game, Jenkins, now of the Golden State Warriors, was honored with a special game ball by Coach Mo Cassara. It was for being the all time scoring leader in Hofstra history. The entire crowd gave Jenkins a well deserved standing ovation. Throughout the entire first half, kids came up to Jenkins for autographs and he more than obliged. Charles Jenkins is truly a class act. If anyone thought that the first half was a fluke, they were quickly dissuaded in the first six minutes. Keith Rendleman tried his best (he had sixteen points and nine rebounds for the game), but the rest of the Seahawks were getting overwhelmed by the Pride. The lead ballooned to thirty, 60-30, with 14:25 left in the game. Moore and Lester had nailed two more three pointers and the rout was on. Late in the second half, Hofstra had a lead of thirty seven points. Think about this. A team that came into the game with only two wins in conference and nine wins in total was beating their opponents 90-53 with a little over two minutes left. Cassara cleared what little he has of a bench (due to injuries, redshirts and dismissals), making sure all his seniors got a standing ovation as they left the court. The Pride would win their last regular season conference game in impressive fashion 93-64. The final statistics were bewildering. Hofstra shot fifty six percent from the field, including twelve of nineteen from beyond the arc. What might have been more impressive was the Pride having twenty five assists and only eleven turnovers. Moore had thirty points, including shooting six of nine from beyond the arc. Lester added twenty points. Stephen Nwaukoni held his own against Rendleman with a double double, ten points and ten rebounds. Mejia and Shemiye McLendon each had ten points. But perhaps the most impressive stat was McMillan with fifteen assists and only four turnovers. Hofstra ended their regular season on a high note. Hopefully it will give them momentum for next Friday night's first round game vs. Georgia State. But at least all three seniors had a truly memorable performance in their last home game for the Pride. Last night was the second day of my four day weekend of hoops. Thursday night, I was at St Joseph's in Patchogue where unfortunately the number one seeded Eagles were shot down by the Purchase Panthers. Then yesterday, my older son Matthew and I made the familiar trip up to New Rochelle to Iona College. Before we could get to the campus of Iona, we had to travel in rainy, slick conditions as the remnants of the Saskatchewan Screamer came down on the New York City metro area. Adding to the fun was a knucklehead on the Whitestone Bridge who kept alternating between the left and center lanes at seemingly his whim. Either he was very drunk or very clueless. I was one of several people that went all the way over to the right lane to avoid him. Of course Matthew, the intrepid little six year old that he is, wisely took the opportunity to sleep the entire way from North Bellmore to New Rochelle. Thus he snoozed while his daddy was yelling at the idiot that was trying to turn the Whitestone into a NASCAR wreck. Matthew didn't wake up until we were in the Iona parking garage. Had I known that the Iona Will Call was not open yet, I would have let him sleep another fifteen minutes. But he was as excited as me to see this game last night. You couldn't ask for a bigger atmosphere on the last weekend of the regular season. This was the battle for first place in the MAAC between Fairfield, the defending regular season champion, vs. Iona, the preseason favorite to win the MAAC. The Hynes Center was sold out and as Nick Guerriero, the Assistant Sports Director and Women's Basketball Play By Play Announcer at Iona (and a good guy too), stated to me that they were turning people away from the ticket booth. To top it all off, the game was being televised nationally on ESPNU. The Hynes Center was packed to the rim. As I surveyed the gym shortly before the team introductions, it was a college basketball fan's dream. Over two thousand people tightly fit into a small gym. A mostly partisan crowd buzzing with the anticipation of another MAAC regular season championship, which would lead to another banner being hung in a venue that has seen its share of basketball history. To say the Hynes Center was electric would be the understatement of the year. And the cherry on top is getting to hear the wonderful Iona Pep Band. What makes this brass band so good is they don't play a lot of the usual tripe you hear other bands play. You won't hear the Iona Pep Band play the "Final Countdown" or "Crazy Train". Yes, they play recent songs from artists like Lady Gaga. But they also play a lot of songs that fit a brass band perfectly; a lot of Earth Wind and Fire, Steely Dan, Santana and they even sneak in some Led Zeppelin (like they did last night). And if you are old school like me, they often play TV and movie theme songs. Their rendition of "I Dream of Jeannie" is a wonderful, bouncy tune. I didn't remember the name of the first song they played. But I immediately knew the second song they played, "Fantasy" by Earth, Wind and Fire. Shortly thereafter, they surprisingly played "Don't Stop Believing". Normally they leave that for the end of the game when the score is close. But I guess they wanted to get the crowd going on what was going to be a momentous occasion. One of the things I have often noticed about the Hynes Center is that as much as I love the Iona folks, the PA volume is much too loud. It's like that at a lot of college gyms and arenas, but outside of the obnoxiously loud Spiro Athletic Center PA system, the Hynes Center PA system seems to stick out. So it was ironic during the introductions that one of the speakers kept going out. It was the brass band gods trying to tell the Iona folks that they have a perfectly good pep band and they should just turn off the system and let the pep band play. Since the wonderful people at the World Wide Leader of Sports schedule games on top of each other at ESPNU, often the preceding game runs over. Especially when it's the physical, foul prone Horizon League games. Thus the game start was delayed while waiting for the end of the Butler - Valparaiso game. However, the silver lining was that the fans were treated to a lot of good Iona Pep Band selections during the wait. First, the band fired up a Stevie Wonder tune. Then they went into Frankenstein. It's one of my favorite renditions of that song. For such a small band; they have maybe at most eight to ten members, the sound they put out is just so good. I share a love of the Iona Pep Band with friend Jaden Daly, the play by play announcer for St. Francis and the author of Daly Dose of Hoops. who is also a fellow member of John Templon's NYC Power Poll. Jaden was covering the game last night for his site and as we were tweeting the song selections, Jaden came up with a bet. The bet was when the Iona Pep Band would play my favorite song and one of Jaden's favorites, Steely Dan's "Peg". I said it would be at the under twelve minute media timeout. Jaden took the over. The bet was a St John's ticket for me (Jaden is a St John's alum) if I won and if I lost, a first level ticket for Hofstra. While waiting for the start of the game, several of us were keeping track of the Loyola - Rider game that was on ESPN2. Novar Gadson hit a three point play late in the game and the Broncs knocked off the Greyhounds. That meant if the Gaels defeated the Stags here, Iona would clinch the MAAC regular season championship. Though it meant the end of a great Iona Pep Band song set, the Butler -Valpo game finally ended and we had the tipoff of our game. Feeding off the crowd's energy, first place Iona came out and scored the first four points. But second place Fairfield, who had come into the game winners of nine of their last eleven games, responded with a 9-0 run. Derek Needham nailed two three pointers and the Stags were up early 9-4. Needham would leave the game shortly thereafter with an injury and would not return. After a Michael Glover three point play made the score 9-7 Fairfield, a short time later we had the under sixteen minute media timeout. This led to the Iona Pep Band playing Rick James "Brickhouse". The band was on a roll and a Stags player was about to go on a roll as well. Senior forward Rakim Sanders is Fairfield's leading scorer. He averages 16.5 points and 8.2 points per game while shooting 50 percent from the field. After the under sixteen media timeout, Sanders took over. He would score five of the Stags next eight points and added an assist. Fairfield had an 18-11 lead going into the under twelve minute media timeout. Sanders had a double double in the first half alone with twelve points and eleven rebounds. As soon as the teams left the court, I heard the first few sweet chords from the pep band and I knew the song . Yes, the Iona Pep Band came through and played Steely Dan's "Peg". I had won the bet with Jaden but I told him I was going to take him to a Hofstra game anyway. Just hearing my favorite Iona Pep Band song was victory enough for me. Coming off the timeout, the Stags extended the lead to 21-13. But the Gaels sped up the pace of the game to their liking and scored the next six points. That got the home Iona crowd going. Fairfield coach Sydney Johnson was forced to call timeout. This led to the pep band playing the James Bond Theme Song. The Gaels actually tied the game at twenty five on a free throw by Glover. But Sanders buried a three pointer which put the Stags back out in front. Iona would actually take the lead, 29-28 on a Glover layup, his ninth and tenth points of the first half. This lead to the Pep Band playing Jaden's favorite song, "September" by Earth, Wind and Fire. Fairfield would respond as they outscored Iona 10-4 for the rest of the half. 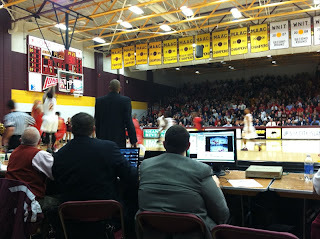 It might have been more, but a good move by Iona Head Coach Tim Cluess kept the deficit at five. During Scott Machado's free throw attempts with five seconds left in the half, Cluess gathered the rest of the players by the Iona bench. I had a good view of Cluess making a hacking motion with his hand. He was telling his players to foul a Stags' player immediately since the Gaels had only five team fouls. After Machado missed his second free throw and Fairfield grabbed the rebound, Kyle Smyth grabbed at Sanders to foul him. But instead Smyth knocked the ball off Sanders and out of bounds. Iona had a last second chance to hit a shot before the half, but Smyth's long three point attempt was short. Fairfield entered the half up 38-33. At halftime, Iona honored Stanley Hill, a 1959 alumnus who was a starting guard on the Iona basketball team. In his sophomore season, Hill was supposed to play in a tournament in Owensboro, Kentucky vs. the University of Mississippi. The Ole Miss coach, Bonnie Graham, informed the tournament committee that he would not have his team play the Gaels if Hill, an African American, was in the lineup. Graham had the support of the University of Mississippi administration. Iona coach Jim McDermott refused to bench his guard and Ole Miss forfeited the game. In a touching moment, the Ole Miss players sought out Hill at the hotel that night and apologized to him for what happened. The ceremony for Hill at halftime, which included several other Iona basketball alumni, was equally as touching. Towards the end of halftime, I went over to talk with Guy Falotico, otherwise known as IonaGuyF on Twitter. While Guy and I were talking about the first half, the Pep Band was playing "Smells Like Team Spirit". Another good song, another good rendition. The second half saw Fairfield jump out to a 42-34 lead. But Iona would go on a 10-0 run over the next three minutes. Reserve Rashad James provided a lot of energy off the bench for the Gaels. His steal and layup gave Iona a 44-42 lead with about fifteen minutes left. The Hynes Center was now rocking. The Pep Band was rocking too. They fired up their third Earth, Wind and Fire song with "After the Love Has Gone" and followed with another Stevie Wonder tune. Jaden was right, all that was missing was their version of Zeppelin's "Immigrant Song" to complete what would have been a great trifecta. Later they played "I Heard It Through the Grapevine". That made up for missing out on Zeppelin. Fairfield wasn't going anywhere and why would they with such great music. The Stags hung in with the Gaels and took a 58-56 lead with eight minutes left. Sean Crawford gave them the lead as he calmly sunk three free throws after being fouled by Taaj Ridley. Enter one Sean Armand. Earlier in the season, I was at Madison Square Garden when the sophomore guard set an Iona and MAAC record for most three pointers in a game with ten in a 95-59 drubbing of Siena. Armand would channel his Siena performance by burying two straight three pointers to give Iona a 62-56 lead and the Iona fans a reason to cheer raucously. Meanwhile, the Pep Band played the NBA on NBC theme song and later the Fox Sports theme song during a stop in the action. Fairfield again wouldn't quit and scored the next seven points. A Desmond Wade three pointer put Fairfield back up one, 63-62 with about six minutes left. Also during this run, Iona's star guard, Scott Machado picked up his fourth foul and and headed to the bench. There was definitely a level of concern running through the Hynes Center crowd. But Armand was far from finished. He would score the next nine points for Iona. His layup put thee Gaels up 71-65 with 2:44 left. Glover would follow later with a layup to put the Gaels up 73-66 with about fifty seconds. Desmond Wade hit a three pointer to cut the score down to four, 73-69. 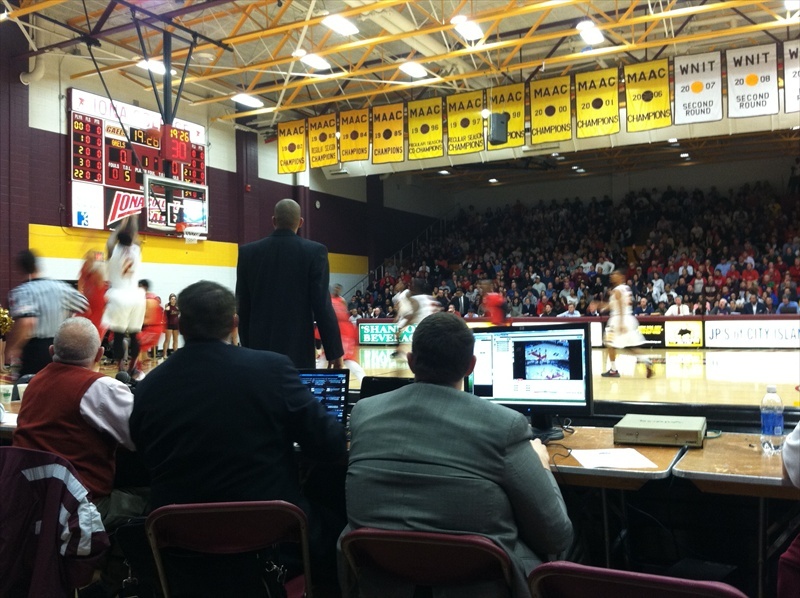 But the Stags would not get any closer as Iona would win the game and the MAAC Regular Season Championship 77-70. Armand scored all seventeen of his points in the second half. As impressive as his performance was against Siena, his performance against Fairfield was more impressive. With Machado on the bench, Armand took over and won the game for his team. His three point jumper is a thing of beauty. Sanders did his best for Fairfield with twenty two points and twelve rebounds. Ryan Olander also had a nice game with fifteen points The two combined to shoot seventeen of twenty nine from the field. But the rest of the team was only ten of twenty nine from the field. The loss of Needham during the game certainly hurt the Stags. As for Iona, along with Armand's seventeen points, Glover had thirteen points and Machado had ten points and seven assists. The key was that the Gaels had more balance than the Stags. Eight players had six or more points for Iona while only four Fairfield players including Needham had six or more points. As Matthew, Tieff, who had joined us shortly before game time, and I quickly left the Hynes Center, we thought we might see a court rush. We were concerned since we were in the front row and having a small child with us, that could be a precarious situation. But it thankfully never materialized. It was as if the Iona fans expected to win this game and be in this position, since they were the preseason favorite. The Gaels and their fans expect their court rush to be after they win the MAAC Tournament Championship in Springfield. It's good to have standards. I know the Iona Pep Band meets mine. The St. Joseph's Eagles entered Thursday night as the number one seed in the Skyline Conference Tournament. They were the top seed based on a 17-1 conference regular season. The Eagles had only lost two Division III games on the season as one of their three losses had been to Division I Yale. St Joseph's was looking for its twenty second win on the season in the semifinals of the Skyline Conference Tournament vs. Purchase. Twice this season they had met Purchase and twice they were victorious. I was there for their first win, a 78-64 home win. In the last regular season conference game, the Eagles rallied from a ten point second half deficit to defeat the Panthers on the road 92-89. In that game, St Joseph's shot a ridiculous nineteen of forty six from beyond the arc. Now it's hard to beat a team three times in one season. It's especially hard when that team, Purchase, is the two time defending Skyline Champion. Thus, St Joseph's had a tough task ahead of themselves last night in front of their home crowd in the Danzi Center. My son Matthew joined me on the drive to the St Joseph's campus in Patchogue. We got to the Danzi Center about a half hour before game time. Before the game, the Eagles had a special ceremony as Coach John Mateyko gave an 1000th career point ball each to Trey Black and Olivier Laurent. As Coach Mateyko noted to me in a previous article on the Eagles, they are a very good shooting team, but they are quite small, as they play four guards for the most part. At the beginning of the game, the Panthers went straight at that weakness by looking inside to six foot eight behemoth Craig Davis, who looks like the Division III version of Jai Lewis (know your CAA legends, folks). Davis scored six of Purchase's first nine points as the Panthers went up 9-2 early. Purchase was still up seven, 12-5, when St Joseph's rallied, scoring seven straight points. An Olivier Laurent layup tied the game at twelve. But the Panthers responded with a 9-0 run. Andre Dixon, a second half of the season addition, just like Davis, scored the last two points of that run to put Purchase back up 21-12 with about twelve and a half minutes left in the first half. But once again, St Joseph's would rally. The Eagles outscored the Panthers 14-7 over the next three and half minutes and would be down only two, 28-26 with nine minutes left in the first half. It looked like St Joseph's was going to go on a serious run. However, it was Purchase that was going to end the half on a serious run. Over the last nine minutes of the first half, the Panthers outscored the Eagles 23-8 as they hit ten of their fifteen shots in that span. Meanwhile, St. Joseph's went cold from the field shooting three for twelve. As a result, Purchase went to the half leading 51-34. The Eagles had no answer for Davis in the first half. Davis is six foot eight and I think fair to say, three hundred pounds. St Joseph's biggest player is Shahab Syed who is listed at six foot six and maybe about 230 pounds. After seeing early on that it was impossible to guard Davis if he posted up, Mateyko would try to double team Davis, as he had one Eagle player front Davis and one would help out underneath if he got the ball. But the Panthers did a good job lobbing it into the big man and Davis was unstoppable, even with two guys on him. He scored seventeen first half points. If St Joseph's was going to come back in the second half, it would have to be a Herculean effort. But Purchase actually extended the lead to twenty, 64-44 with fifteen and a half minutes left. St Joseph's scored the next six points to cut the lead to fourteen, 64-50. But a Davis layup started a 7-0 mini run for the Panthers and the score became 71-50. Time was running out on the regular season champions. However, the Eagles didn't quit. They were able to cut the lead down to fourteen 75-61 with about nine minutes left. Eric Klingsberg, whose three pointer cut the lead to fourteen, had a chance to cut the lead even further. But he missed the first of the one and one free throw attempt. Purchase then scored the next eight points and the game was over. Purchase would go onto win 105-81. St Joseph's had no answer for Davis who had twenty nine points, fourteen rebounds and shot fourteen of nineteen from the field. The Panthers as a team shot sixty two percent from the field and out-rebounded the Eagles 52-19. St Joseph's was led by Klingsberg, who came off the bench to score nineteen points. However he was the only Eagles' reserve to score points for his team as the Purchase bench outscored the St Joseph's Bench 38-19. It was likely the difference in the game as points off turnovers (St Joseph's 22-8) and second chance points (Purchase 19-5) evened out. It was also a cold shooting night for the best three point shooting team in the Skyline. Chris Jimenez, Black and Laurent combined to shoot two of fifteen from beyond the arc as the Eagles shot only ten of thirty four from beyond the arc and twenty seven of sixty four from the field (forty two percent). Now Coach Mateyko and his Eagles must wait out Selection Monday for Division III teams (the NCAA Division III field is decided next Monday). Only sixty two teams make the Division III NCAA Tournament. The Eagles have the fact that they are 21-4, went 17-1 in conference and were the regular season Skyline Conference champions. They also defeated Purchase twice in the regular season, as well as twice defeating Farmingdale State, the other tournament finalist and have a big road win over a once ranked Eastern Connecticut team. Hopefully it's enough to give them their second Division III NCAA Tournament bid. Based on their resume, they certainly deserve it. Cross your fingers.